Order your very own personalized mosaic to hang where it will make a difference every day. Surround yourself with that which inspires and nurtures you. Each piece is unique, hand made from stained glass and mixed media. Many pieces of lovely glass are cut and fit for these mosaic artworks. A hand welded metal frame makes this suitable for indoor or outdoor display. 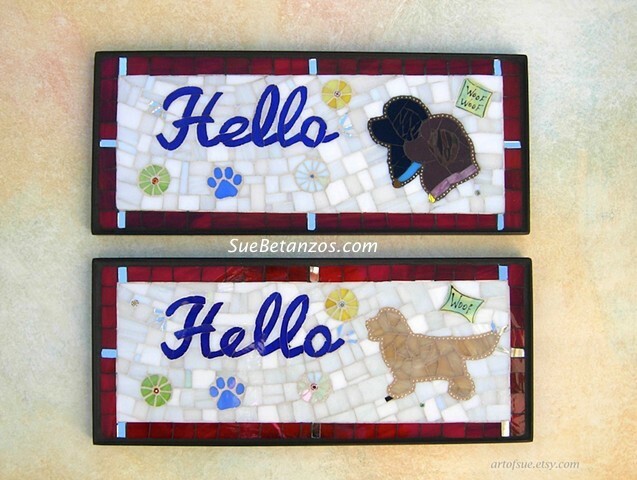 •This listing is for ONE 15"x6" Hello glass mosaic with one simple animal subject. Examples in this photo. Put your pet on a welcome sign! Prices vary with size and details. Larger glass mosaics will be more.